There currently are 294 guests online. This collection includes large graphics so they'll work well for printed projects, they can also be reduced in size for web graphics, All images are high quality 300dpi in JPEG & transparent PNG formats. You may use this clip art for commercial & personal use (some restrictions apply) The clip art is ok for commercial use on your own website eBay or ETSY but cheryl doesn’t allow them to be used for multi vendor websites unless you have a multi vendor licence. You may NOT: Give away for free any creations you make via groups or forums. You may give away the occasional sample via your own website or blog. 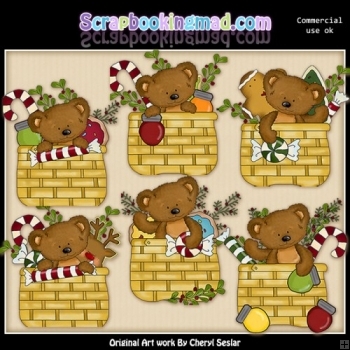 Scrapbookingmad is a licensed reseller for Cheryl Seslar Designs. This product was added to our catalog on Saturday 22 October, 2011.